This page was created because there is no central database for incidents and accidents involving lasers. This page points regulators, media, researchers and others to the various databases and resources that do exist. The resources listed have information primarily from the United States. See the About this site page for credits to persons who helped compile this list. Probably the single database containing the largest number and greatest variety of laser incidents and accidents is the one maintained by Rockwell Laser Industries. It is the first one listed below. •	An incident is an event which potentially could have caused personal injury or property damage, but did not. •	An accident is an event which caused personal injury or property damage. Each database listed below may have its own definitions. Also, some sources include accidents as part of incidents (e.g., an accident is a serious incident), while other sources keep these separate for statistical purposes. So be aware that some "incident" counts may include accidents, while others may not. For ease of discussion in the information below, we will use "incidents" generically to include both incidents and accidents. As a service to the laser community, Rockwell Laser Industries keeps a Laser Accident Database of incidents which were reported to them. As of September 2018 there are thousands of incidents in the database, dating from 1964 to about 2009 when new incidents were no longer published. These have "been gathered from a broad range of sources since 1964. By studying this data, the laser community as a whole can promote the safe and knowledgeable use of lasers and prevent similar events from occurring in their own facilities. For more information about the laser accident database, please contact us via email or call an RLI representative at (800) 94-LASER." The U.S. Food and Drug Administration is the federal agency responsible for the safety of laser products, and of three laser uses (measurements, demonstrations and medical). This is regulated by FDA's Center for Devices and Radiological Health. You may see "FDA" and "CDRH" used interchangeably. A list of FDA's medical and laser device databases is here. 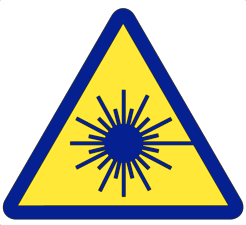 The FDA databases that are most relevant to searches for laser incidents and accidents, including faulty laser devices, are listed elsewhere on this webpage. FDA/CDRH's Radiation-Emitting Electronic Products Corrective Actions database provides descriptions of radiation-emitting products that have been recalled under an approved corrective action plan to remove defective and noncompliant products from the market. Searches may be done by manufacturer name, performance standard, product name, description, or date range. FDA/CDRH regulates manufacturers of radiation-emitting electronic products under the Electronic Product Radiation Control (EPRC) provisions of the Federal Food, Drug and Cosmetic (FD&C) Act. EPRC authorities apply to manufacturers of radiation-emitting electronic products used both in non-medical applications (e.g., laser engravers, microwave ovens, security x-ray scanners) and medical applications (e.g., ultrasound therapy, diagnostic x-ray devices, LASIK). Manufacturers of radiation-emitting electronic products which are also medical devices are subject to both the EPRC and Medical Device authorities of the FD&C Act. Corrective actions defined under EPRC are similar to Corrections and Removals defined in the medical device provisions of the FD&C Act, both of which are commonly known as “recalls.” Manufacturers are required to perform corrective actions on their electronic products when a radiation safety problem exists that was caused by the design, manufacturing, or assembly of the product. refund the cost of the products to the purchasers (and reclaim the products) without charge to the owner of the electronic product. A September 2018 search of this database found 94 results containing the word "laser." The U.S. Occupational Health and Safety Administration is the federal agency responsible for laser-related workplace incidents and accidents. As of September 2018, there are 16 reports, from 1988 to 2015, with the keyword "laser" in the OSHA Fatality and Catastrophe Investigation Summaries database. In 12 of these reports, the laser beam itself was not involved; for example, an employee was crushed in a laser machining device. The remaining 4 reports were of eye or skin injuries from contact with the beam. Members of the public can search the database for safety information about products that are in their home already, or that they may be thinking about purchasing. Beginning March 11, 2011, reports of harm that contain minimum information required by law and that provide the submitter’s consent, will be posted in the database at www.SaferProducts.gov. The public can search the database and review reports approximately 15 business days after a report is submitted to the CPSC. Product manufacturers (including importers) and private labelers that are identified in a report may submit comments to be displayed in the database along with the report. Information about product recalls is also available for search and review in the database. Due to the voluntary nature of reporting, this may not be a representative or clinically-validated sample set. Report dated 11/13/2013: A parent purchased a toy gun from a circus which contained a laser; while there was no injury, the parent felt the toy was not safe. Report dated 11/1/2013: A pet toy has a laser beam aimed by a moving mirror so as to "play" with the pet. The consumer said the mirror could aim the beam into a pet's eyes, and claimed the laser was "dangerous to sight." Report dated 1/10/2012: An ink pen with stylus and laser pointer is arranged so the laser aperture faces the user when the stylus or pen is in use. The laser activation button can be pressed while in use. The person reporting said the laser shined on his cheek, "narrowly missing his eye." The manufacturer responded on 2/17/2012 that "The subject product was evaluated by an independent testing agency. Such agency concluded that the product complies with applicable laser safety specifications and regulations." Report dated 12/7/2011: A toy "infrared air guitar" that in a promotional YouTube video emits a visible red laser beam that is strummed to trigger notes. The consumer says the manufacturer stated there is no visible laser beam but instead a non-visible infrared beam "like a TV remote." The consumer is concerned that if it emits a laser beam this could cause temporary blindness. It is unclear whether the consumer actually had the product or was referring to the YouTube video. While all states with laser regulatory programs require reporting of laser injuries, we are not aware of any that keep a database of such reports. Rockwell Laser Industries has a list of State Laser Safety Contacts. The International Laser Display Association (ILDA) has a webpage with a list of laser light show incidents. ILDA also has a webpage for the general public to report laser light show incidents/injuries. ILDA makes a distinction between incidents occurring to laser show technical staff, which usually happen very close to the laser during operation, service or maintenance, and incidents occurring to the public including audience and performers, which usually happen much farther from the laser aperture. LaserPointerSafety.com includes statistics from the U.S. and many nations, and links to various studies about laser incidents and injuries, both aviation-related and consumer injuries. On the consumer injuries page is a link to an Excel spreadsheet of reported eye injuries. This lists various scientific papers and journal articles discussimg laser eye injury cases, most of which have been examined by ophthalmologists. The website also has over 1,300 news items about laser incidents. Each item is indexed under at least one category and one tag. This makes it easy to find, for example, all news items about aviation incidents that have a claim of an eye injury. A complete list of all categories and tags is on the Index to news stories (categories and tags) page. Since 2004, the U.S. Federal Aviation Administration’s Advisory Circular 70-2 has required pilots to report laser illuminations of aircraft. Injury (Yes/No). Note that "Yes" can include a headache, flashblindness or other effect that does not rise to the classic definition of an injury as involving tissue damage. The Comments field may have more specific information about the effect or injury. "Aircraft reported cockpit illuminated by a green LASER from the left side while N bound at 1,800 feet 3 NM S of MEM. No injuries reported. South Haven PD notified. ::GJS6192, CRJ 7, ARRIVING MEMPHIS LANDING RWY 36C ENCOUNTERED LASER EVENT 3 MILES SOUTH OF AIRPORT, WAS GREEN NO INJURIES REPORTED, DEN AND LOCAL AUTHORITIES NOTIFIED, LANDED WOI [without incident]." While pilots are technically required to report all laser sightings, anecdotal information indicates that — after many years of such incidents with no reduction — pilots may be reporting only more significant events. Thus, the actual number of laser/aircraft illumination incidents may be higher. FAA laser illumination incidents rose from 46 during 2004, to a peak of 7,703 in 2015, and have since declined to 5,663 in 2018. Cumulatively, from 2004 through 2018, there are 49,132 recorded incidents in the FAA database. Hover over or click on data points to get exact numbers. The charts will not appear if you are using Internet Explorer; please try another browser. An online searchable database of reports is available. The database provides a foundation for specific products and subsequent research addressing a variety of aviation safety issues. ASRS's database includes the narratives submitted by reporters (after they have been sanitized for identifying details). ASRS is an especially useful resource for laser/aircraft incident reports prior to 2004, the date that FAA’s AC 70-2 began to require pilots to report such incidents to FAA. Because it is not required for pilots to report to ASRS, this is best understood as accounts of the more serious illuminations that pilots encountered — ones that they would take extra effort to report. A September 2018 text search for "laser" in the narrative found 192 reports. Of these, 29 occurred between June 1988 (the earliest report) and December 2003, while 163 occurred January 2004 or later. A quick review shows that most, but not all, of the reports are from pilots reporting laser illuminations of their aircraft. The FDA/CDRH database Manufacturer and User Facility Device (MAUDE) database contains reports of adverse events involving medical devices. The download data files consist of voluntary reports since June 1993, user facility reports since 1991, distributor reports since 1993, and manufacturer reports since August 1996. The searchable database data contains the last 10 year's data. MAUDE may not include reports made according to exemptions, variances, or alternative reporting requirements granted under 21 CFR 803.19. MAUDE includes a large number of laser equipment malfunctions. Some caused personnel injury while the overwhelming number are equipment-related problems. An unusual factor in this database is that the equipment manufacturer has the opportunity to respond to the reported incident. Persons using MAUDE may be interested in a 2010 Master's thesis by Katelynn Tonn, "Characterization of Medical Laser Related Occupational Injuries in the US FDA MAUDE Database." Tonn found 1,084 cases from 1990 to 2009 of injuries and deaths related to the use of medical or dental lasers. Of these, she found only four that "contained adequate information to apply to two human factors models that were used to evaluate the root cause of the injuries presented in the descriptions provided." Tonn concluded "It was found that cases lacked consistency throughout the database and even those that provided adequate information for the human factor models did not allow for a full assessment. The MAUDE database is in need of review and updating." The FDA/CDRH database Medical Device Reporting (MDR) allows you to search the CDRH's information on medical devices which may have malfunctioned or caused a death or serious injury during the years 1985 through 1996. It is no longer being updated since MAUDE (see above) has superseded MDR. The Medical Product Safety Network (MedSun) is an adverse event reporting program launched in 2002 by the U.S. Food and Drug Administration’s Center for Devices and Radiological Health (CDRH). The primary goal for MedSun is to work collaboratively with the clinical community to identify, understand, and solve problems with the use of medical devices. It lists medical device adverse events from 2002 and later. If you search for “laser” for all years, 465 records come up; not all of these are from radiation exposure. In 2018, LaserPointerSafety.com did an analysis of NEISS data from 2000 to 2017. The analysis noted that not all injuries using the term "laser" were to eyes. Some were due to swallowing laser pointers, or being injured by a pet when playing with a laser pointer. The analysis lists all "laser" reports, and highlights those with eye complaints or eye injuries. According to the analysis, NEISS's 100-hospital sample received 6,678,321 injury reports from 2000 to 2017. Of these, there were 37 eye complaints or injuries caused by laser light. This was not a large enough number for CPSC to make any estimates of the total number of eye complaints or injuries in all U.S. hospitals. The Agency for Healthcare Research and Quality (AHRQ), part of the Department of Health and Human Services, is the lead Federal agency charged with improving the safety and quality of America's health care system. The AHRQ is cited as the source for statistics in Economic Trends in Eye-Related Hospitalizations (PO118), a poster presented at the American Academy of Ophthalmology's 2015 annual meeting. The Johns Hopkins University study "identified a sample of nearly 47,000 patients ages 0 to 80 diagnosed with ocular trauma from 2002 to 2011 using a national heath care database [AHRQ]." A brief review of the AHRQ website finds pages describing data resources, including the Healthcare Cost and Utilization Project (HCUP) which appears to be the data source for the 2015 study of ocular trauma. Running an sample analysis, HCUP allows searches from a fixed list of diagnoses or procedures — but the keyword "laser" does not appear except as part of laser eye procedures. Thus, a search for laser injuries and accidents may require additional effort to separate these from eye or skin injuries in general. Mostly anecdotal clinical reports from medical journals. This is not really a database but just a searchable index of articles. DoD has recognized the need for a general guidance for laser incident reporting within the DoD. The Laser System Safety Working Group, which includes laser experts from all services, drafted a new DoD Instruction for Protection of DoD Personnel from Exposure to Laser Radiation and Military Exempt Lasers. This instruction directs all services to report suspected laser exposures to the tri-service laser hotline at Brooks AFB. Instruction 6055.15, DoD Laser Protection Program. The United States Army Medical Research Detachment of the Walter Reed Army Institute of Research maintains the Laser Accident and Incident Registry. LAIR has six categories: incident, exam, treatment, laser system, subject, and source information. A June 2003 SPIE paper, Laser Eye Injuries Among US Military Personnel, "found a total of 29 laser injury reports that met our case definition. Since 1965, when the first injury occurred, there have been 6 Air Force, 15 Army, and 8 Navy/Marine injuries reported. Statistical analysis of data analyzed thus far shows no difference between the services in 8-year risk groupings between 1965-2002." The Department of Energy's Occurrence Reporting Program (ORPS) provides timely notification to the DOE complex of events that could adversely affect: public or DOE worker health and safety, the environment, national security, DOE's safeguards and security interests, functioning of DOE facilities, or the Department's reputation. DOE analyzes aggregate occurrence information for generic implications and operational improvements. The Occurrence Reporting Program directives are DOE Order 232.2A, Occurrence Reporting and Processing of Operations Information, and DOE Standard DOE-STD-1197-2011, Occurrence Reporting Causal Analysis. Legal databases are a resource to find laser incidents and accidents that led to lawsuits or other legal action. For example, a February 2013 study in JAMA Dermatology, "Common Causes of Injury and Legal Action in Laser Surgery," searched Westlaw to find legal cases, jury verdicts and summaries, and trial court documents involving cutaneous laser surgery. The initial search used a variety of search terms, and resulted in 1,809 documents from 1985 to 2012. Subsequent evaluation found that 174 of these documents concerned injury from cutaneous laser surgery, the focus of the study. Although it is a massive database, only one legal database was searched for the study. Cases within the database are those in which some form of legal action was taken, excluding complaints handled outside the judicial system (ie, third-party arbitration through malpractice carrier). This is likely to have excluded many frivolous claims with little merit. The query was a retrospective review and was limited by the search terms selected. There are probably some decisions that did not contain the searched terms. Lay terminology may elude a database search as used in this study. Information was not complete for all cases, even after it was supplemented through additional research. A significant number of the cases are still pending. Because these legal documents are lay documents (ie, not medical record), the facts presented were assumed to be true. Understanding Laser Accidents provides a comprehensive reference addressing the full spectrum of laser accidents. 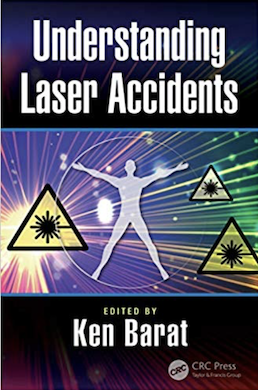 Starting with a fundamental review of biological effects, this book details why laser accidents occur, as well as real-world tips on how to avoid mistakes, preparing for accidents, regulatory response, and responsibilities. Biological effects of laser wavelengths, a critical topic for laser users, and unique properties of ultrafast lasers and tissue damage are discussed in detail. Where Do I Find Laser Accident Information? How Many Wrong Decisions Can One Rationalize Away? This 2013 English-language study is a comprehensive survey of reported laser pointer injuries. The Swedish Radiation Safety Authority is trying to correlate injuries with the laser intensity. The study was conducted because little information exists on the eye damage severity that may be expected at various laser exposure levels. This English-language study is a 2015 survey of 47 reported laser pointer injury cases since the previous 2013 survey (described above) was published. The cases are described in the Appendix. The following abstract is from “Retinal Injury Following Laser Pointer Exposure: A Systematic Review and Case Series”, by Birtel et. al., in Deutsches Aerzteblatt International 2017; 114(49). The entire paper has useful information about laser pointer injury numbers, causes, severity and treatment. For persons who want to keep up with laser-related incidents and accidents in the general media, Google has a service where you can set up alerts for specific phrases. If Google sees news stories or new web content with those phrases, you can get emailed links to the sources. For the topics above, roughly 10-20% of the Google Alerts are of some significance. The other 80-90% are stories that happen to contain these phrases such as "the midfielder kicked a laser strike into the goal" or "the prosecutor used a laser pointer to show evidence to the jury" or "the Air Force is testing lasers to attack other aircraft." Depending on your needs, setting up a Google Alert may be useful.